Featuring all the best dorky Drake dance moves. Last night, Drake was the host and musical guest of Saturday Night Live, in which he played a multitude of roles including the 70's R&B legend Dennis Walls, a clueless contestant on Black Jeopardy, and an awkward commentator for American Ninja Warrior. For the musical performances, Drake performed two tracks off his latest release VIEWS: "Hype" and "One Dance," which is his first number one single as a solo artist. 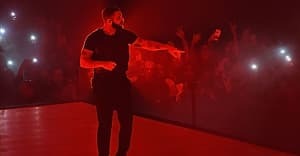 While "One Dance" features Drake pulling out his dorky dance moves on a white-lit stage, "Hype" called for a darker, more ominous staging complete with fog and fake snow. Watch the performances above and below. Watch Drake's full SNL episode here.